Hi guys! Hope you liked seeing some old pictures of me this morning. I really wish i had more of those on my computer…ohh the days of actual developed photos. This morning I went to 6am spin again and am loving it more and more each time. I usually get in a weights workout afterward, but I couldn’t today since I had to be at work early for training. Instead I just tried to work extra hard during spinning and am hopefully going to get in some strength training tomorrow. I had a breakfast cookie for breakfast and a provided veggie wrap at lunch. I always like to plan ahead for work meetings because there often aren’t Clare-friendly options, but I was pleasantly surprised today! Even at breakfast there was oatmeal and fruit instead of pancakes and bacon, and the veggie wrap at lunch was pretty decent. No pictures, sorry. We ate lunch very early so I had two bars as snacks this afternoon. One was just a peanut butter Luna Bar, but I also tried a new bar I found at the grocery store. 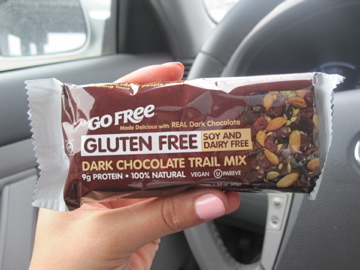 This “Go Free” bar had all real ingredients and 9 grams of protein. I loved the dark chocolate flavor mixed with chewy dried cranberries and crispy rice cereal. Would definitely get it again! 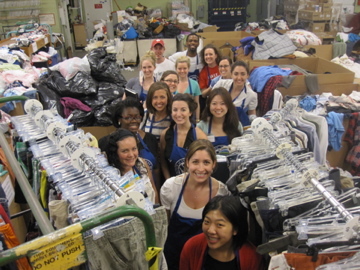 Our service project was at St. Vincent de Paul where we helped sort and hang donated clothes. Not the most glamorous work, but always fun to chat more with my work friends. I don’t get to see them all that much since we work in different areas. What I REALLY wanted to do while there was buy some of their dishes! 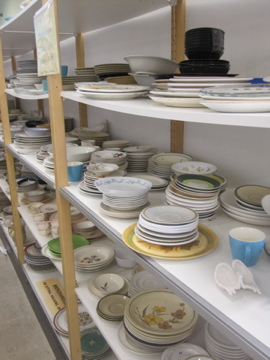 There were rows and rows of plates, bowls, and cups just screaming my name. Took some major will power to not buy tons of random pieces, but mine already overflow in my mother’s cabinets. The project ended up finishing a bit early, so we arrived to our group dinner early as well. I wasn’t feeling very hungry since I had two snacks so I decided to order my dinner to go. We ate at Duffs, a restaurant in a trendy area of town called the Central West End. I loved how many vegetarian options they had (including vegetarian meatballs!!). I got the Rainbow Chicken Salad © mixed greens, chicken, peppers, onions, carrots, cabbage, snow peas, ginger vinaigrette, except the vegetarian version with grilled tofu. I dug into this just now while watching Glee and LOVED it. 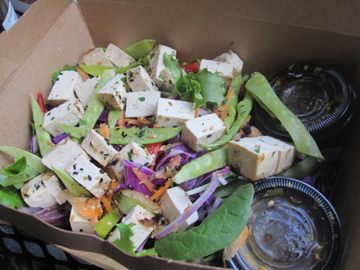 The dressing was a bit oily, but the tofu was amazing! It was perfectly grilled and chewy — almost tasted like a cube of mild cheese. I really want to know what type of tofu they use because I would buy it. Do you ever volunteer? What was the last project you did? I’ve beem loving big bowls of melon or dessert…so satisfying! That salad looks wonderful! Glad it was a good day girly. my guess is white wave tofu. that’s what terrene used to use when they had tofu tacos. Love the top. I do volunteer events at the school I teach at.. join committees to help fundraise..e tc. Next up is a 2 mile walk/run.. kids had to raise money to participate. It is pretty cool.. I am excited to up bright and early marking the route.. then hoping I am not too busy and can run it too! 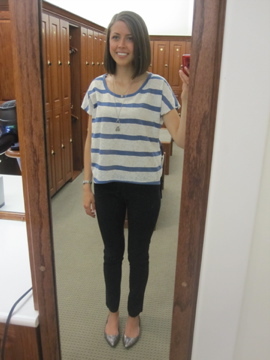 I love your striped shirt! I’ve seen those Go Free bars, but haven’t tried one yet. Sounds like a delicious flavor/texture combo. I volunteered at the race last weekend handing out water and GU to the runners, but I’d love to make time to volunteer more often…for kids! The last thing I volunteered for was last summer. I was a Student Nurse at Camp Hot Shots which is a three day camp for kids with Diabetes. It was a really neat experience. I would really like to get involved with volunteering at the humane society. I know they let people come in and take the dogs for walks! I would love to do that! I did some volunteering with a dog rescue for a while but its about 45 min away and I just can’t afford to go as much anymore even though I wish I could. That tofu looks very good! I’m not a vegetarian but I do like tofu and get every so often and I feel like its either amazing or not very good. I guess I need to give it some more chances. ahh i missed glee tonight:( so disappointed in myself! I love volunteering! I mostly sit on local community event committees. The last volunteer committee I was on I chaired the local Christmas parade and downtown festival – which was so much fun! Great outfit as always! Such a nice smile! i am trying to get more into spinning…but i just dont think it is my thing.. i was at the gym bright and early thought today. to go before work i need to get there at 5am…so usually i go after. Oh, and that Glee episode was awesome! It really made me want to attend my prom again.